Audi Sport (formerly Audi Quattro) is working on redesigned versions of the RS 4 and RS 5. The new cars are expected to ditch the naturally-aspirated V-8 engine of their predecessors and adopt twin-turbocharged V-6 power. A presentation slide from a recent dealer meeting, obtained by Motor1, reveals some of the specs we can look forward to. The slide reveals that the powertrain will be the twin-turbocharged 2.9-liter V-6 that made its debut in the 2017 Porsche Panamera 4S. Peak output is said to be 450 horsepower and 442 pound-feet of torque. That compares to the 450 hp and 317 lb-ft of the 4.2-liter V-8 fitted to the predecessor models and the 440 hp and 406 lb-ft the twin-turbo V-6 produces in the Panamera 4S. Further information revealed in the slide included 0-62 mph acceleration of under 4.0 seconds and a governed top speed of 155 mph. Buyers will be able to lift the top speed to 174 mph with an available Dynamic Package, though. The RS 5 is said to be entering production first, in June 2017. 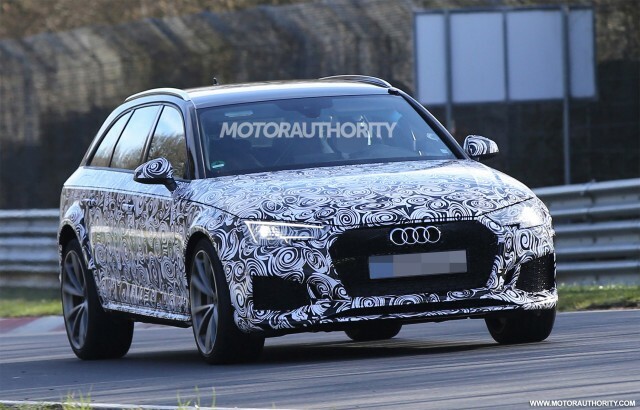 The RS 4 is said to start production in December 2017. Unfortunately, the RS 4 isn’t expected in the United States as it will once again be offered exclusively as a wagon. As for the RS 5, a leaked presentation slide from early 2016 revealed that the car in coupe form will be available in 2018. A redesigned RS 5 Cabriolet should follow shortly after. And we might also be treated to an RS 5 Sportback at some point.